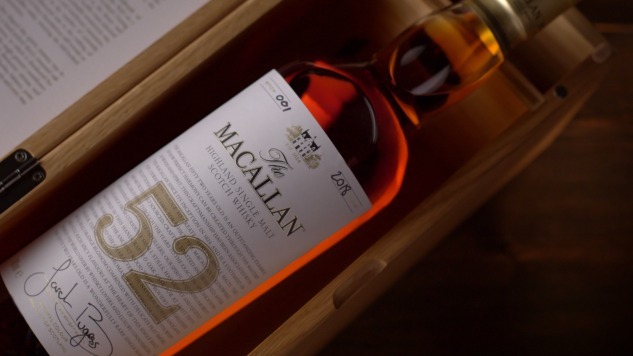 The Macallan has a new 52-year-old whisky. The latest addition to the distillery’s portfolio is a bottle that’s been slowly matured for 52 years in a first-fill European oak sherry seasoned cask from Spain. Only 250 bottles of the whisky will be sold, in part because all of the bottles are coming from a single cask. The Macallan is selling the whisky in “a luxurious solid oak box,” that features an etched face inlaid with a matte gold-badged age statement. Tasting notes for the whisky say the nose has Rich cherry and dark chocolate layered with antique oak. Wisps of floral orange blossom combining with delicate layers of peat smoke. On the palate you’ll get Rich fruit overlays dark chocolate fondant, wisps of peat smoke meet cinnamon and ginger from the wood spices. The whisky has a long finish with notes of sweet oak, cherry and blackcurrant mellowing out to a floral and lightly peated finish. As you might imagine, only a few bottles are expected to make their way to the United States. The Macallan plans on bringing just 42 bottles stateside, with a suggested retail price of $53,500 for a 750ml bottle.